Claim: President Obama has announced he will force Americans to pay slavery reparations beginning in 2016. Both Facebook posts were published to Facebook during a race-based controversy in the United States over an altercation between teens, adults, and police at a pool party in McKinney, Texas. This timing was notable because the content featured in the articles dated back to approximately April 2015. According to a recent report from Fox Business News, the White House is about to make a highly controversial move. In an outrageous move that is bound to create even more racial discord in America, Obama will push for reparations for slavery in 2016. This prediction was made by Fox Business News host Charles Payne during Thursday’s episode of Making Money. Obama fully supports the United Nations Declaration for the Rights of Indigenous People, so he will push for Americans to pay slave reparations as a way to satisfy the treaty. 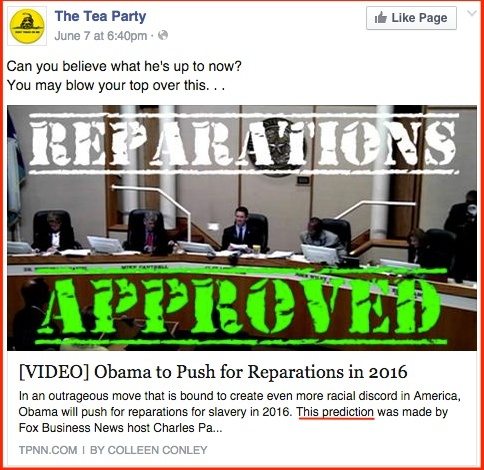 American News and TPNN published posts about “slavery reparation” articles to their Facebook pages on 9 June 2015 and 7 June 2015, respectively; however, the underlying articles those posts linked to had been published on 18 April 2015 and 31 May 2015. No related events, statements, or developments occurred to prompt the republication of those articles, yet those republications coincidentally occurred during race-related debates prompted by the pool party incident in McKinney. Tea Party News Network director Scottie Nell Hughes, a frequent Making Money guest, agreed with her host: “Sure, slavery was a horrible thing that happened, but this is not going to help race relations in the United States today,” she said.